Jennifer's Little World blog - Parenting, craft and travel: Treacle Suet Pudding - an Autumn treat! If you are looking for a warming autumn or winter treat, you can't go far wrong with this delicious treacle suet pudding. This was first baked as part of the Great Bloggers Bake Off, inspired by the Great British Bake Off, and another week with things which I've never even eaten before, let alone baked! The themes for this week were suet pudding, choux pastry and three different types of pastry. I decided that I would make suet pudding as my parents were visiting for the weekend and I knew that they would help me out with the eating of it. I had never bought suet before, so I had to ask some fellow baking bloggers where to find it in the supermarket (in the baking aisle as it turned out). I went for vegetarian suet as it sounded slightly more appetising. 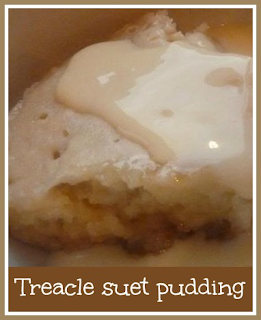 A quick Google turned up a simple recipe for treacle pudding which you can find here - Treacle Suet Pudding. I didn't much fancy trying to steam a pudding, and so fortunately this one was made in the microwave. It was incredibly easy to make and tasted delicious when served with custard. So easy to make in fact that I know I'll be making it again. This week, the challenge for me wasn't so much about the baking part but the fact that I've tried something new which I never would have made otherwise and discovered something delicious that I'll be turning to again! This post was linked up to the Great Bloggers Bake Off hosted by The Crazy Kitchen and Mummy Mishaps. you can't beat a pudding & custard on these cold days! thanks for linking up. As one of the test eaters, I can confirm that it was very yummy. Seconds were needed. I'm going to be making another one very soon!